Last year Sennheiser was given the opportunity to collaborate with Pink Floyd for the Pink Floyd: Their Mortal Remains Exhibition at the Victoria & Albert Museum in London, England. 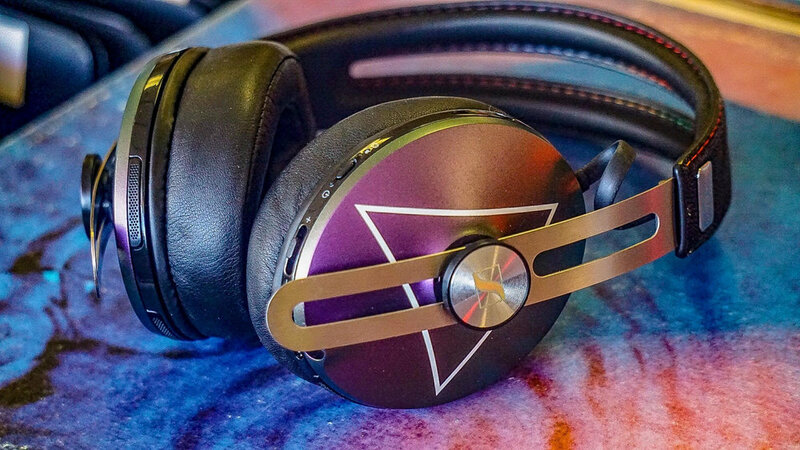 For this union the company provided audio for the showcase, but they also crafted The HD 1 Wireless edition celebrating The Pink Floyd Exhibition: ‘Their Mortal Remains’ in honor of the iconic group. They were kind enough to send over a pair for review. The headphones arrived neatly packaged in an excellent carrying case (plus they come with a cool cloth sack for added protection) that felt sturdy and equipped to handle daily wear and tear, but still maintains a fairly sleek profile. The case won't take up too much real estate on your desk or within your bag and is a great inclusion to help protect your investment. Build integrity is excellent and doesn’t sacrifice fashion or flare in favor of comfort. The outer design is very attractive with a smooth and snazzy aesthetic that is further elevated by it’s iconic color scheme. The buttons are ergonomic, easy to navigate, and responsive. I personally didn’t experience any lag or delay when toggling the volume either. The enclosures fit snuggly around the ear (even for people like myself with larger heads) and rests firmly in place once adjusted to your liking. I felt confident that once secured, they wouldn’t slip off and it only took a few minutes to get acclimated to them due to their light, unobtrusive profile. At first I was a bit nervous about the exposed cords leading into the earcups, but after a few days the anxiety subsided as they are thick and will spend the most time pressed near or against your head. A subtle detail that I truly enjoyed was the colorful and precise stitching on the headband. It gives the already beautiful design an extra bit of oomph that really differentiates these from the competition on a visual level. Sennheiser boasts an impressive 22 hour battery life and after several extended listening sessions, I am inclined to believe them. I had no issues whatsoever with the duration of the battery and the needs of even the most dedicated of listeners should be satisfied (in most situations) on a single charge. The bluetooth connectivity was snappy and straightforward and there were no serial numbers, wifi codes or lengthy connection procedures. Simply turn on your device (an iPhone 6S+ in my case), and the headphones should do an admirable job of syncing with your product of choice. Now for the pièce de résistance, the sound quality. For me, I thoroughly enjoyed the range of frequencies that poked through the mixing on certain tracks. On acoustic or live-sounding tracks, the Sennheiser profile is on full display and it’s marvelous. It was magnificent observing the layers of sound as they gently dissipate and melded with other atmospherics present within some of the compositions I listened to. The bass did get a little overpowering at times, but not enough to completely overshadow other elements in the mix. When the lower, rumbling bass frequencies are absent, percussive instruments are fleshed out extremely well here. For this price point, it is a bit puzzling that they didn’t include a charging base or reinforced micro-USB cable. The standard cable is fine and seems fairly durable, but seeing as this model is significantly more expensive than the original HD1 model, it isn’t as excusable. These are of course covered by Sennheiser’s ubiquitous two-year replacement warranty, but it would have been nice to have gotten that extra design assurance. Not including a cleaning cloth and a bit more padding in the headband is another head-scratcher. I also had access to a pair of Bose Quiet Comfort 35 as that is an associate’s headphone of choice and the noise-cancelling on these doesn’t quite stack up. It’s good, but not excellent. Ultimately, you can’t go wrong with the HD1 but whether or not the increased price point is worth it will depend on your degree of Pink Floyd fandom or admiration of the aesthetic differences presented here. Many of this model’s shortcomings are a result of the steep price hike as the higher MSRB highlights and magnifies it’s missteps. This product suffers more from what’s left out of the box as opposed to the quality of the model itself. If you have the extra cash though, i’d recommend picking these up as the visual nuances on this edition are beautiful.